This beautiful St.Charles Ave condo is spacious, contemporary and cozy!! Our beautiful condo is located on the historic St. Charles Avenue streetcar line! It’s surrounded by world renown restaurants in addition to bars, coffee houses, parks and more! This is the BEST location to experience Mardi Gras Parades because they pass directly in front of the condo!! Not to mention you can hop onto the Streetcar for $1.25, which will take you on a scenic ride Downtown in minutes to visit The Famous French Quarters, Bourbon St., Harrah's Casino and other local attractions!! This property is newly renvovated and surrounded by the beautiful greenery of St.Charles Ave. we have a private patio and terrace for entertaining or for enjoying a night cap or morning coffee! We have every amenity there is to offer from a washer and dryer to a fully stocked kitchen! We are within walking distance to bars, cafe’s, grocery stores. Book stores and every cultured restaurant you could think of! 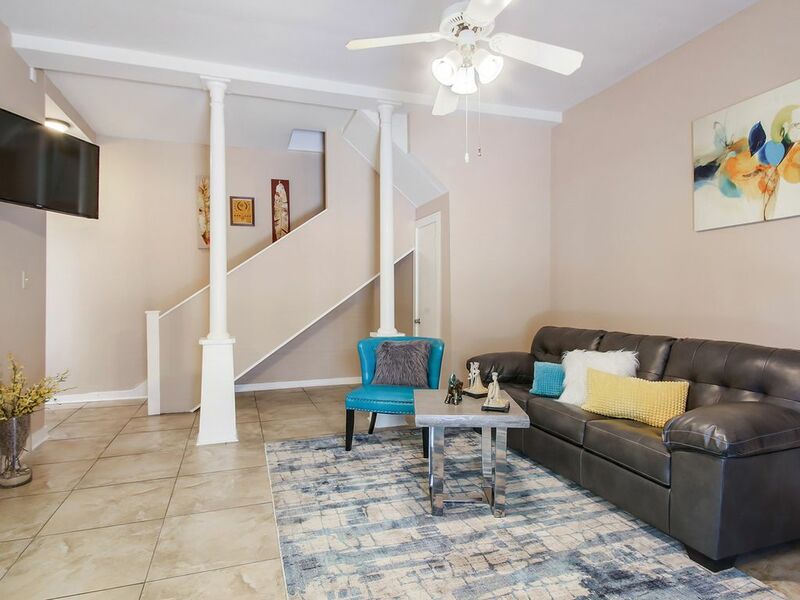 The unique benefits of staying at this property is that it’s centrally located, on the streetcar line (so you don’t need a car), minutes away from every tourist attraction New Orleans has to offer and is located in the famous Garden District of New Orleans! There is coffee and tea (with condiments) provided. There is a fully stocked kitchen, with stainless steel appliances (dishwasher, refrigerator, stove/over). There is a granite counter-top with two bar-stools. Private chef and transportation services are available upon request. The location is perfect with the streetcar stop right across the street. Accommodations were clean and spacious. Downstairs was the kitchen, laundry and living/dining room. Cozy atmosphere and nicely decorated. Upstairs is an incredibly large bedroom with two queen beds. The downstairs sofa/sofa bed was comfortable in my opinion. We did not use the back deck, though it was nice, because there were dogs on two neighboring properties upstairs decks that barked and barked when we went out. Lockable gate at end of walkway making it very secure. I highly recommend this rental. It was absolutely wonderful with all the comforts of home. Perfect location, the place was spotless and so very comfortable. Many places within walking distance and of course the trolley right out front. The place was quiet and we had no problem getting a good nights sleep for our entire stay! I would definitely stay there again! We simply loved it!! Exactly as Advertised. Great location! Location was perfect. The streetcar stops right in front and so easy to ride—24 hour day pass only $3! The condo is fully stocked with everything we needed and more. Easy access, directions were clear, and Kionna was so responsive and professional. The condo is spacious and modern. Enjoyed our stay...definitely coming back!! Awesome property with private entrance very secure area. The street car is right out front and you can take it anytime day or night to the French Quarters. Beautiful area great restaurants in the area. Love the property private patio out back and Kiana is awesome to work with. I absolutely recommend this property. Listing the good things first, the location is very nice as it is in the middle of the Garden District and very close to the trolly and old cemeteries. Now to list the bad things... This listing is not listed properly, it is NOT a two bedroom location. It is a one bedroom duplex with a living room that has a Sofa bed. The bedroom upstairs does have two beds, but there are NOT two bedrooms. Whoever of your group gets sleep on the Sofa Bed, you may want to warm them about their future horrible sleep they will receive. The mattress is very thin, the springs can be felt through the mattress, and the entire thing squeaks like a bird. When this issue of the listing not being a two bedroom was brought up to the property owner, nothing was done to fix the issue. We simply were told, that it was properly listed. Also, it was very difficult for the guests sleeping upstairs to sleep due to not one, but two barking dogs. Overall I would not recommend this listing, and personally felt the owner didn’t care about my issue. We took a chance and booked a newly listed property with no reviews. It was absolutely a great idea. The edge of the Garden District. Just blocks from Magazine St and all the great shopping and food choices. Plenty of free on street parking (Memorial Day week). Although this is on St. Charles Ave, it's in the back of the building, so you do not hear the streetcar ($3 per 24 hour unlimited rides, direct to the French Quarter) out front. Secure, locked back yard with overhang was good for keeping our bikes safe and out of the weather (leave the road bikes at home, bring your MTB or gravel bikes) . Slight glitch when we arrived (power was out in the neighborhood). Kionna offered us another nearby spot but we opted to stay and power was back on shortly. Clean, comfy and absolutely as advertised. Thanks so much for allowing us to accommodate you, it was such a pleasure! We would love to have you all back anytime!